Larry Ellison is stepping down as Oracle's CEO, a position he has held at the company since he founded it in 1977. Ellison is the world's top-paid CEO, bringing in $78.4 million last year. Technically, his salary is only $1 -- he gets paid in company stock options. He's the fifth-richest person in the world, with a net worth of $51 billion, according to Forbes. Safra Catz and Mark Hurd, Ellison's top lieutenants, will replace him as co-CEOs. Catz has been Oracle's president since 2004, and Hurd joined Oracle after his unceremonious ouster as CEO of Hewlett-Packard (HPQ) in 2010. Both Catz and Hurd are also well-paid. Both took home $43.6 million in 2013. 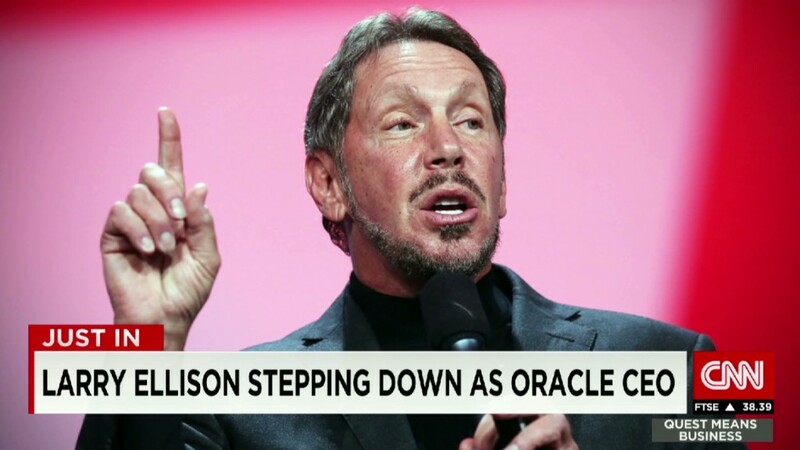 The 70-year old Ellison will remain at Oracle (ORCL), taking over as executive chairman of the company's board on Thursday. He was also given the title of Chief Technology Officer. He will continue to work "full time," shifting his focus from management to product engineering, according to company director Michael Boskin. Ellison is known for his brash, outspoken demeanor and his affinity for yachting. Ellison's Oracle Team USA won the America's Cup yachting race in San Francisco last year. But the victory was controversial -- Ellison's team was fined $250,000 by an international jury for making illegal modifications to its 2012 yacht. Investors don't seem thrilled about Ellison relinquishing the CEO post. Oracle shares dropped over 4% on Friday after the company reported profits that were well short of expectations. The announcement also came the same day that rival firm SAP (SAP) revealed that it is acquiring Concur (CNQR), a cloud based expense management system.